When World of Warcraft launches a content patch, it’s often more like a mini-expansion. This is exactly the case with tomorrow’s patch 5.2 The Thunder King content update. 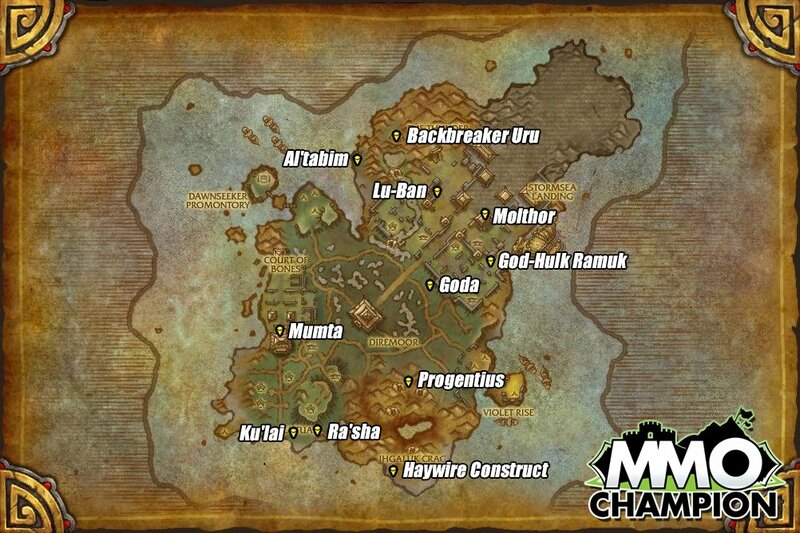 An entirely new troll-themed island is added to the geography introduced with Mists of Pandaria. Players will have to unlock the content on the island progressively. As more of the island becomes available, players will be able to dive into a new 13-boss raid instance with new raid gear (T15, for those that are counting), new daily quests, and, of course, new rewards. Who doesn’t want a dino mount? But what you’re really itching to know is how to get in to the new loot grabbing scenario and where does the new Thunderforged equipment drop and how do you turn your warlock spellfire green? We answer all that and more below. How do I get to the Isle of Thunder? How do I get to the new loot grabbing scenario? The Troves of the Thunder King solo scenario can only be started after you have looted a Key To The Palace of Lei-Shen. The key drops off of rare mobs on the isle, hidden chests around the island and in reward satchels for completing daily quests. Turn the key into the Shado-Pan NPC at your faction base on the Isle to queue for the solo scenario. What’s the best strat for the Troves scenario? You have five minutes to open the most chests you can in the instance. If you kill the boss mob at the end, you can open extra chests behind him. In addition to the gold and random loot, each chest has a chance to hold Burial Trove Key. The boss chests have a greater chance to grant these. When your run is over, you are taken to a special treasure room where those keys can open up to 10 additional chests. The best strat is to gain rep with your Isle faction (Kirin-Tor Offensive for Alliance and Sunreaver Onslaught for Horde). The faction vendors sell items that will help you get past the many traps and mobs that eat up your precious seconds. These items do cost precious Elder Charms of Good Fortune, but you will be able to loot Elder Charms in the scenario. Also any item or talent that adds to your run speed should be prepped.